KUALA LUMPUR (Jan 8): The average amount that Malaysia’s middle class segment desires to have for retirement is RM1.9 million, according to a survey conducted by the AIA Group. In the survey titled “Hopes and Asipirations of the Middle Class in Asia”, Malaysia’s middle class said saving for retirement is a serious challenge, with 33% citing enjoying a comfortable retirement as the most difficult goal to achieve in life, and 53% stating they are worried they will not save enough for a comfortable retirement. 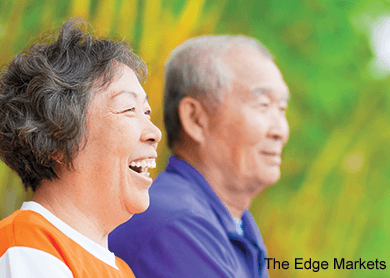 AIA Bhd chief marketing officer Thomas Wong said Malaysian respondents had indicated a variety of investments instruments to achieve their retirement plans. “These investment instruments include contributions to regular retirement plans (70%), investing in the stock market (70%), real estate (61%), and contributing to a regular savings account (50%),” he told a news conference today. The survey was conducted in 2014 among 3000 self-identified middle class individuals from six Asean markets, namely Malaysia, Indonesia, the Philippines, Singapore, Thailand and Vietnam through online and face-to-face interviews. In Malaysia, the survey was conducted among 500 respondents aged 25 years above and living in Peninsular Malaysia, with an average household income of RM6,339 per month. These Malaysian respondents also have, on average, RM160,000 in assets, considerably higher than those in Thailand, Vietnam, Indonesia and the Philippines. Besides retirement, the survey covered areas such as quality of life, financial security as well as family and education. On financial security, 53% of Malaysian respondents believe that financial security can be achieved in their lifetime, while 47% feel that it is a never-ending pursuit. “Generally the Malaysian middle class has a higher expectation on how much is needed to achieve financial security compared to other Asean markets surveyed. On average, Malaysian respondents said they need RM1.5 million in asset value in order to feel financially secure,” said Wong. By contrast, on average, the middle class in Thailand, the Philippines and Indonesia feel they need about RM360,000, RM864,000 and RM451,000 respectively to feel secure. One concern raised by Malaysian middle class was rising healthcare costs, with 51% stating that they are concerned over the cost of healthcare, and 46% stating that they are concerned about the cost of unexpected emergencies. On AIA's 2015 outlook for healthcare costs, Wong said this would still be a concern due to factors such as advancement in medical technology. “We don’t think that the rising healthcare cost trend is going to change too much, simply because of factors such as advances in medical technology, which translate into higher healthcare costs. These would fuel medical inflation to an extent,” he said.